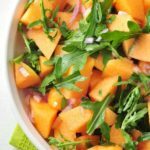 This Cantaloupe Arugula Salad with poppy-seed dressing is a simple spring or summertime salad with surprisingly bold flavours. 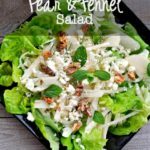 It’s the easiest salad you’ll make all year! 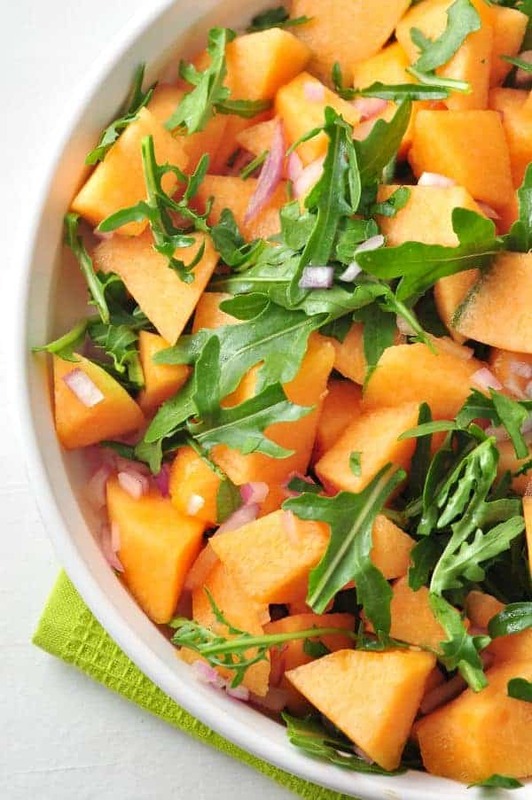 The secret to this Cantaloupe Arugula Salad is to start with a perfectly ripe melon and the freshest arugula you can find. Nothing compares to the flavour of freshly picked fruit and vegetables. Have you ever been disappointed when cutting into a cantaloupe and finding that it is either underripe or overripe? Here are some tips to help choose a good one. 1. Colour. The rind should be cream or yellow-coloured and the webbed pattern should be slightly raised. If it’s green and the webbing is flat, it’s not ripe. A little green is just fine. 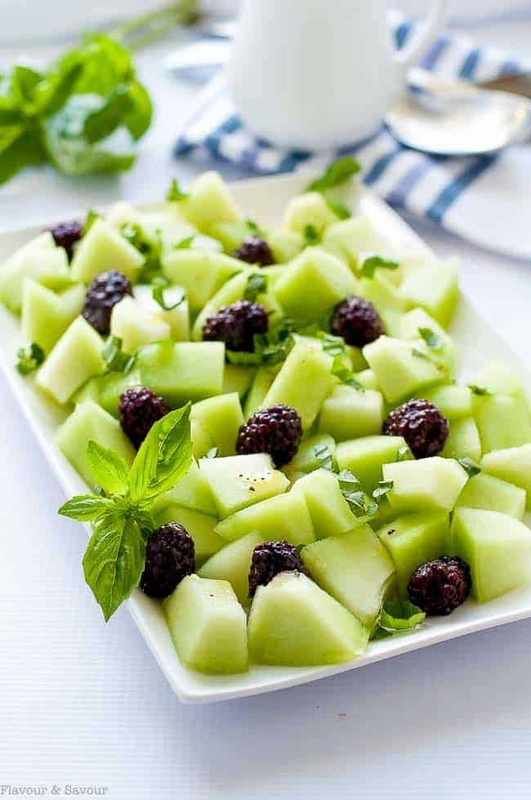 Unlike other fruit, cantaloupe does not ripen after it has been picked from the vine. 2. The Belly Button. The stem end should be smooth, round and flat. If it still has a piece of stem attached, it was probably picked too early and will not ripen properly. 3. Smell. Have a quick sniff of the stem end. It should be fragrant and smell like cantaloupe, but not be overpowering. 4. Blemishes. Avoid those with bruises or moldy spots. 5. Feel. It should feel firm but not too firm. Check the ends. It should have a little give, but not be mushy. 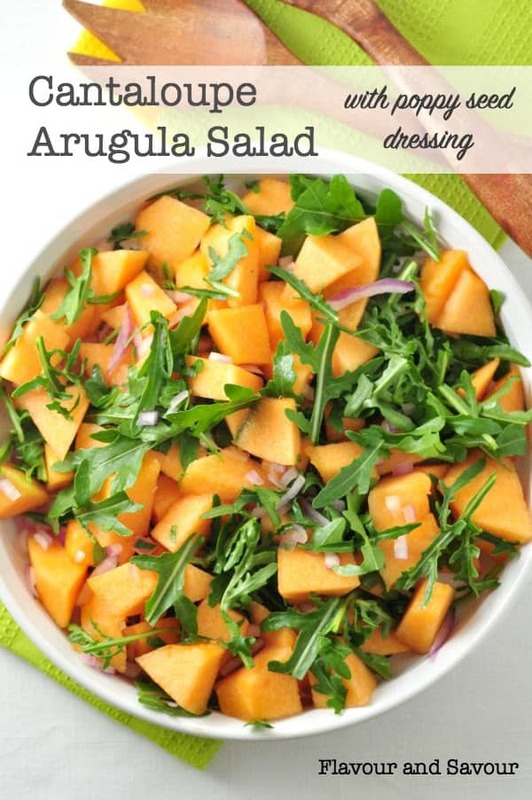 If you grow your own arugula, you’re guaranteed that it will be fresh! Arugula has a short shelf life. It only last for about 2 – 3 days, so use it right away. 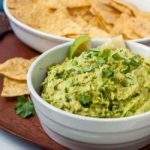 If you are buying it, look for leaves that are dark green and richly coloured. Avoid those that are limp or dull. 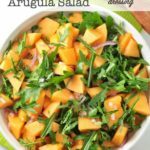 This Cantaloupe Arugula Salad is seriously the easiest one you’ll make all year! 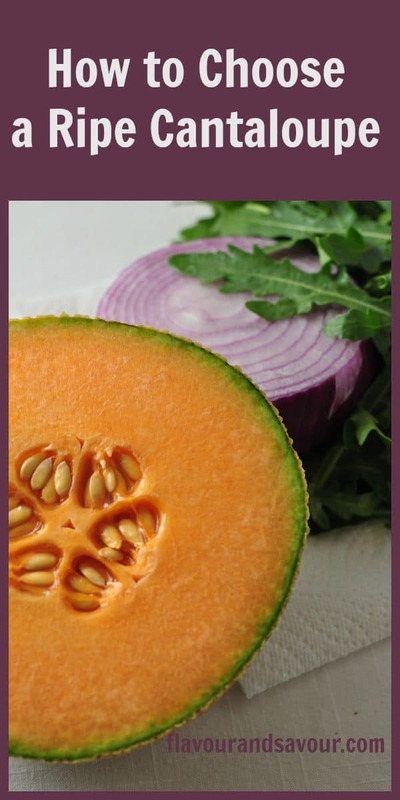 Make it today while cantaloupe is still in season. It uses the same Poppy Seed Dressing as the one in my recipe for Strawberry Kale Salad. 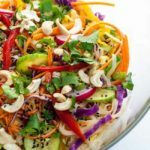 It’s quick to prepare and uses honey instead of sugar as a sweetener, making it a healthy alternative to your usual green salad. 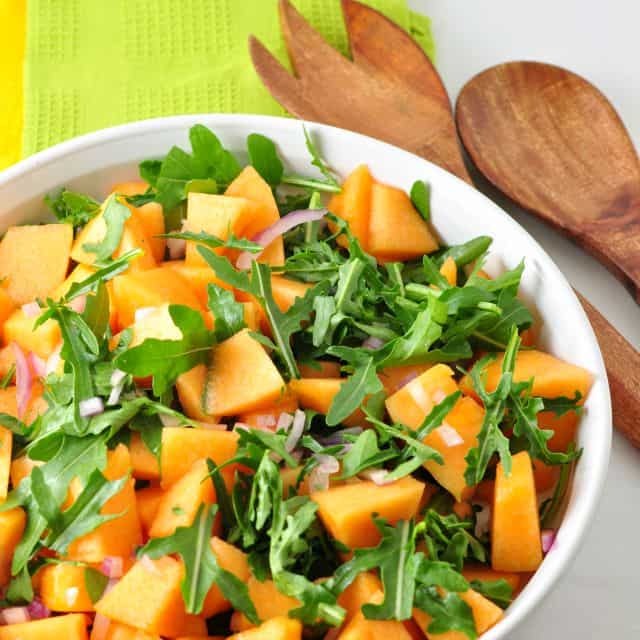 This Cantaloupe Arugula Salad is a simple spring or summertime salad of cantaloupe, arugula and red onion, tossed in a creamy sweet Poppy Seed dressing. Combine the Poppy Seed Dressing ingredients in a small glass jar and set aside to allow flavours to blend. Wash the outside of the cantaloupe thoroughly to prevent possible contamination when you slice into it. 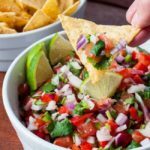 Slice in half, remove seeds, then cut into wedges. Slice down to the rind to create chunks, then slide a sharp knife underneath to remove the rind and release the chunks. Place in a salad bowl. 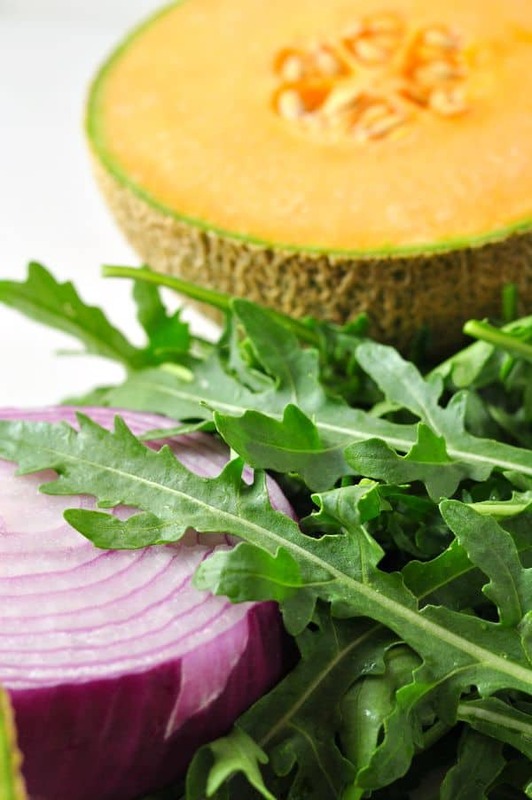 Add washed, dried and torn arugula leaves and finely diced red onion. Toss with Poppy Seed Dressing just before serving. I made this salad for the first time today. WOW it is delicious. The flavors are so satisfying. I thought it would be a bit bland. NOT AT ALL! AND.. my picky husband loved it! Will be making a lot this spring/ summer!